Available now through October 29 only, reserve your place in line to be one of the first to take Prodigy-5 to the world! Start today by purchasing your ticket to a private live training with Drs. Ambati and Saucedo from Paris on October 29! Purchase of this ticket automatically signs you up to receive your Prodigy-5 Pre-Launch pack for only $299.95 USD on October 29! Normally a $450.00 USD value, you’ll get the product first and you’ll save off the normal pre-launch price! Now is time to set you and your business up for success the moment Prodigy-5 is officially pre-launched in Paris! *A $12 Membership fee will be added for new Members. **Your $20.00 USD ticket purchase acknowledges that your payment method will be charged on October 29, 2016 in the amount of $299.95 USD (or the equivalent amount based on your local currency) plus tax and shipping for the Prodigy-5 Pre-Launch pack. Join Us Every Tuesday Through October 11, 2016. Each week we will expand on another facet of this incredible product and opportunity. Help us make the webinar attendance bigger and bigger each week! Prodigy-5 Business Highlights Next Week! Join Ron Williams and ForeverGreen leaders and staff next week to find out the Business Highlights (and surprises) surrounding Prodigy-5! You already saw a sneak peek of the new ForeverGreen business conversation and we aren’t holding back in the weeks to come. Israel, Africa, MEA, Europe, etc. Please note, we are now using a webinar platform called Zoom for our corporate calls/webinars. You can access these webinars online, via telephone (audio only), or through the Zoom mobile app. Please be aware Zoom will be automatically downloaded if joining online from a computer. If you plan on joining on a mobile device or tablet, we recommend downloading the Zoom app (found in the Google or Android app store) to your device ahead of time. If you don’t yet have your tickets for the 2016 Paris Momentum European Convention, now is the time! 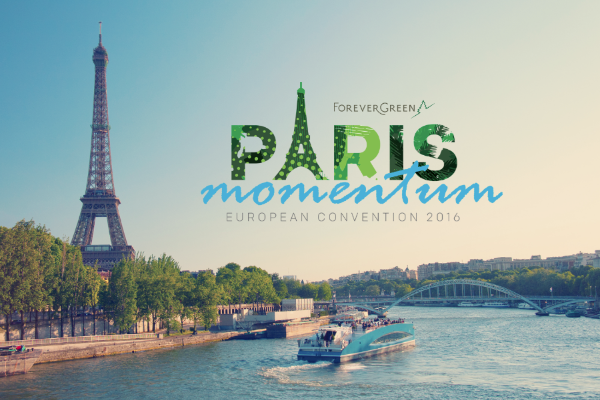 Dr. Ambati will be speaking for the first time to ForeverGreen Members LIVE in Paris. Join us to be sure you’re the first to hear his story and learn how Prodigy-5 can change your business! Get your tickets or register your physical tickets by clicking below.